Robert Pattinson’s Twilight days are way behind him, as evidenced by his work in such character driven work in Maps to the Stars, The Rover, and most recently The Lost City of Z. With Good Time, however, Pattinson may have taken his acting chops up another notch as a bank robber who’s determined to save his mentally disabled brother (Benny Safdie) from harm. The feature received a standing ovation during its premiere at Cannes, and it’s safe to say Pattinson may be remembered come Oscar nominations time. 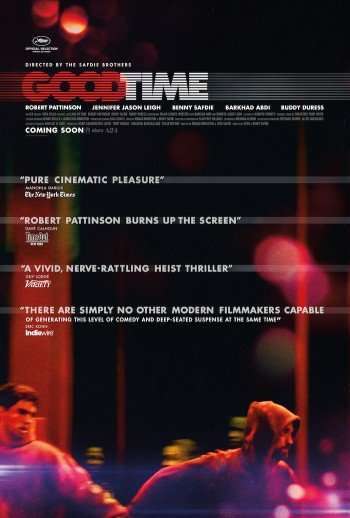 The second trailer to Good Time, directed by the Safdie Brothers, has just been released, and while glimpses Pattinson’s charismatic and heart wrenching performance is sprinkled throughout the video, the biggest eye catcher are the visuals. Even in the darkest of New York nights (Queens to be exact), the diverse colors pop amidst the inevitable shadows that will descend upon these hapless siblings. Check out the trailer below and tell us what you think! Good Time opens nationwide August 11.